Do Khyentse Yeshe Dorje was born in 1800, into a nomadic family in the Golok region of Amdo. When his parents were on pilgrimage to Lhasa, his mother, Tsewang Men, had an experience in which she was led by two women through the wall of the Machik Pal Lha shrine, into an extraordinarily beautiful palace. There she had an intimate encounter with protector deity, Nyenchen Thangla, appearing as a noble youth. Afterwards, she found herself back at the shrine where her husband and others had been looking for her for three days. After this experience, Tsewang Men became a medium and gave birth to Do Khyentse. She was of the Dawa clan and his adoptive father was Chokor Sonampel of the Golok Akyong clan. Upon Do Khyentse’s birth, he recited the Sanskrit alphabet, and then vanished for three days. He recounted later he was taken by a red woman to a pure land crystal palace, where he was purified through the cleansing ritual performed by many lamas and dakinis. While he was an infant he experienced countless pure visions of Guru Rinpoche, dakinis and Dharma protectors; and wherever he went he saw local spirits and other non-human beings. At the age of one he was joyfully reunited with the First Dodrubchen, Jigme Trinley Öser, who immediately recognised Do Khyentse as the rebirth of his teacher, Rigdzin Jigme Lingpa. 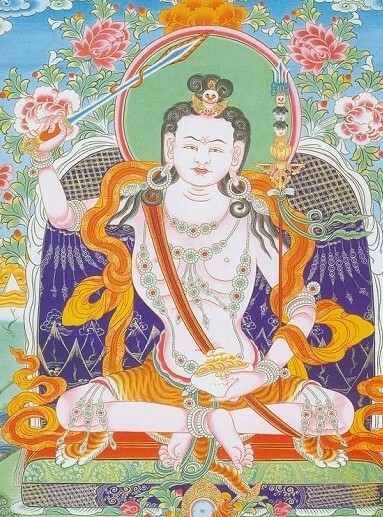 For his part, Do Khyentse saw Dodrubchen as Guru Rinpoche. From then on, together with his parents, he stayed with Dodrubchen, who became his root Lama. Dodrubchen bestowed the empowerments and reading transmissions of Nyingthig Yabzhi, Longchen Nyingthig, Dzödün, and the writings of Jigme Lingpa upon Do Khyentse. When Do Khyentse was officially recognised as the mind emanation of Jigme Lingpa, he was moved from Dodrubchen’s encampment and Dzogchen Monastery and enthroned, first in Dege and then in Ü (Central Tibet), where Jigme Lingpa’s family and seat were situated. In Central Tibet Do Khyentse received novice vows from the Fourth Drikung Chetsang, Tenzin Pema Gyaltsen. He was given many teachings and empowerments from other lamas such as the Eighth Tsurphu Gyaltsap, Chöpel Zangpo, who gave him the Yutok Nyingthig and the collected works of the Karmapas and of Gampopa. When he turned eleven, Do Khyentse received a message from his root Lama, Dodrubchen, requesting him to return to Kham for a visit. At Yarlung Pemakö Monastery he trained, both with Dodrubchen himself as well as with other masters, in the full range of teachings of Sutra and Tantra, from both the Old and New translation lineages. In 1815 Dodrubchen sent him again to Central Tibet, where he received teachings and transmissions from many great masters, and spent some time in retreats at Chimphu and Samye. Although short, these retreats were filled with visions and miraculous events. Following his master’s advice, Do Khyentse went to seek out Getrul Mahapandita at Kathok, who trained him in tsalung and bestowed empowerments and transmissions of Kama and Terma upon him. He also met the Second Drimé Shingkyong, Jigme Rigdzin Gonpo, from whom he received the Guhyagarbha Tantra, Mayajala, and the Rong tradition of Vajrakilaya. Being the tulku of Jigme Lingpa, even as a teenager Do Khyentse’s realisation was already vast and his days were filled with extraordinary experiences such as clairvoyance, receiving blessings and transmissions from Guru Rinpoche and Yeshe Tsogyal, and discovering termas. Although many high lamas and officials preferred Do Khyentse to remain a monk, Dodrubchen saw that he was destined to become a white-robed (lay) tantrika. Accordingly, offering all he possessed to Dodrubchen, Do Khyentse exchanged his monk’s robes for those of a hermit mendicant and left his hair to grow long. Dodrubchen was happy to see his young disciple in this garb and gave him much advice on practising without regard for wealth, comfort or status. Dodrubchen also gave him the transmission of Khandro Yangthig and further instructions on Yeshe Lama. And so, in the knowledge that they would not meet again in that lifetime, with much sadness Do Khyentse bade farewell to his precious Lama, Dodrubchen, and set out on the path of a wandering yogi. Although he had adopted the traditional white robe of a tantrika, he would soon exchange these for the dress of an ordinary layman. While practising in solitude he had numerous visions, including one of Dodrubchen during which the latter imparted his last testament and blessing upon Do Khyentse. From this he understood that his Lama had passed away. Refusing entreaties by Dodrubchen’s monastery to become his master’s regent, Do Khyentse wandered the countryside of Golok in the guise of a hunter, miraculously reviving many people and animals that had either died or been killed. Around this time he also took a consort with whom he would later have three children. Their daughter, Khaying Dölma (1823-1855), was born amid miraculous signs and eventually married the king of Trokyap, but died childless at the age of thirty-three. Of his two sons, Sherab Mebar (1829-1842) was a tulku of the first Dodrubchen but died at the age of fourteen; and Dechen Rigpe Reltri (1830-1874) became khenpo at Dorje Den. Once he began to impart the teachings of Longchen Nyingthig, his fame began to spread and he became the Lama of a number of kings and powerful tribal leaders. In 1831 he finally settled in the Tartsedo region and became the Lama of the King of Chakla, who was his main patron. However, Do Khyentse retained the lifestyle of an accomplished siddha, and would become famous for his unconventional ways. Although he would receive students formally in his encampment, he also wandered the region with his gun, reviving the animals he had struck down, thereby inspiring faith in his disciples and the local people. Once, after killing a wild sheep, he told his companions to take the meat and roast it over a fire, but to carefully keep the bones and skin. One of his disciples could not help but think that such behaviour was strange for a great master. Sensing his student’s doubts, at the end of the feast, Do Khyentse asked him to bring the skin and bones. When these had been gathered in front of him, Do Khyentse entered into deep meditation and then snapped his fingers. At that very moment the sheep got up, shook itself, and walked away. However, the animal was limping a little: someone had forgotten to bring back a small piece of bone from one of its legs. On another occasion, he and his disciples were travelling past a notorious nomadic camp when they were attacked by two guard dogs, one white and one black. To protect everyone, Do Khyentse cut both dogs in half. When the nomads found out he’d killed their dogs, they came to seek revenge. Unafraid, Do Khyentse placed the hind quarters of the white dog on the forequarters of the black, and the hind quarters of the black dog on the forequarters of the white. Then, snapping his fingers both dogs got up and ran away. Once, two young shepherds wanted to test Do Khyentse’s clairvoyance. One of the shepherds pretended to be dead, and the other then beseeched the master for prayers for the ‘deceased’. Do Khyentse sat and smoked three pipes, putting the ashes on the prone shepherd’s head. Once Do Khyentse had departed, the boy turned to his friend, only to find that he had actually passed away! He ran back to Do Khyentse, confessed and pleaded for him to revive his friend. Do Khyentse returned and said “DZA!” over the body, and the shepherd regained consciousness; whereupon he expressed sorrow over being brought back, as he had been sent to a joyful pure land. The shepherd became a disciple of Do Khyentse and later, an accomplished meditator. He displayed countless other miraculous abilities, such as flying, passing through solid objects, and the subjugation of non-human entities. He also revealed many termas, including several mind treasures. He continued to teach, primarily Dzogchen, until 1866, when he passed away amidst a miraculous display of lights and sounds that lasted for days. Among his many disciples were the Second Dodrubchen, Jigme Phüntsok Jungne (1824-1863), and Patrül Rinpoche (1808-1887).